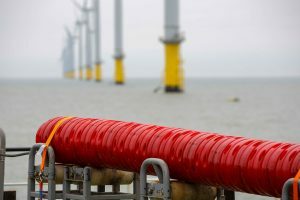 Inch Cape Offshore Limited (ICOL) and Boskalis have signed an exclusive Pre-Construction Agreement (PCA) covering the transportation and installation of the wind turbine foundations, the offshore substation, and the inter-array cables. 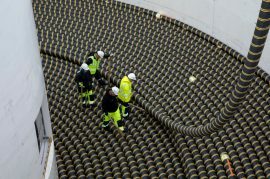 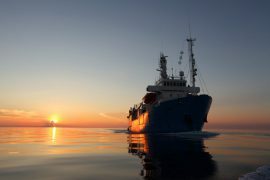 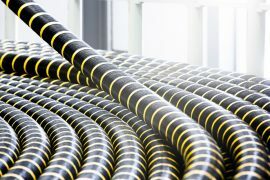 Boskalis and NKT have secured export cable contracts by 50Hertz for the Ostwind 2 offshore grid connection in Germany. 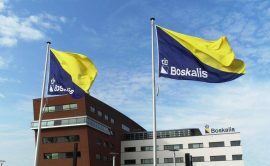 Royal Boskalis Westminster N.V. has nominated Carlo van Noort to be appointed as Chief Financial Officer (CFO) of Boskalis at the Annual General Meeting of Shareholders (AGM) in May 2019. 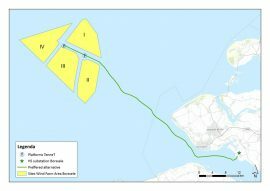 Royal Boskalis Westminster N.V. will use a biofuel blend on the project to install the export cable to the Borssele offshore wind farm in the Dutch North Sea. 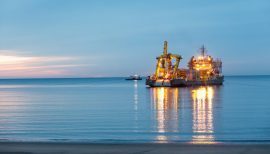 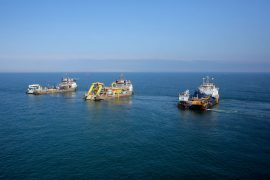 Boskalis Subsea Cables & Flexibles – formerly VBMS – has signed a five-year subsea cable repair framework agreement with the UK Offshore Transmission Owner (OFTO), Transmission Capital Partners (TCP). 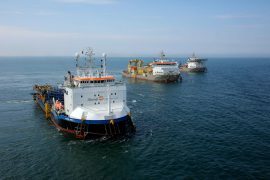 Nexans, using Boskalis’ fallpipe vessel (FPV) Rockpiper, is set to commence the rock emplacement campaign for the installation of the first of two export cables (EC1) in the Beatrice offshore wind farm export corridors on 21 December. 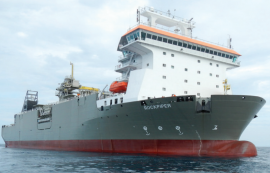 Royal Boskalis Westminister is proceeding with a plan set out earlier this year to boost its presence in the subsea services market, after posting solid results in the segment in the third quarter of 2017. 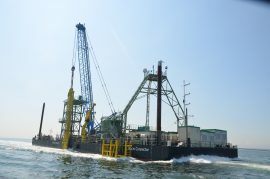 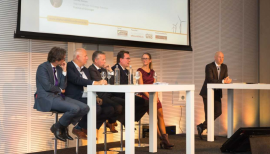 While there is a downturn in the oil and gas market, Boskalis – which serves the offshore energy sector – can count on its flexibility, as it can tap into offshore wind with its large range of vessels and skilled personnel, according to Pieter Wijnmaalen, Commercial Manager at VBMS, Boskalis’ daughter company working in the offshore wind market. 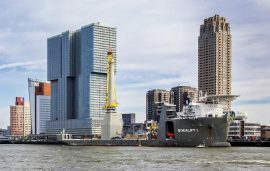 Royal Boskalis Westminster’s Offshore Energy division reported an operating result (EBIT) of EUR 36.1 million for the first six months of 2017, a 66.5% decrease compared with an EBIT of 107.7 million reported during the same period a year earlier. 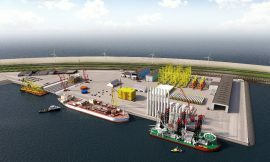 Boskalis has awarded Peterhead Port Authority with a contract to harbour the suction bucket jacket foundations for the 11-turbine European Offshore Wind Deployment Centre (EOWDC) in Aberdeen Bay, Scotland. 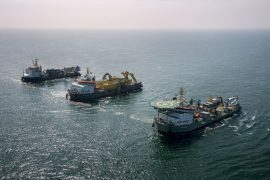 Boskalis has kicked off rainbowing works at the Maasvlakte 2 site, where the Port of Rotterdam is setting up the Rotterdam Offshore Center, dedicated to the offshore wind and oil and gas industries. 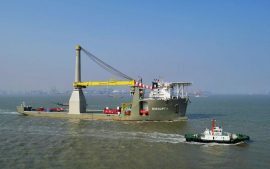 Singapore-based Keppel Shipyard has secured a contract from Royal Boskalis Westminster N.V for the conversion of a semi-submersible heavy lift vessel, Finesse, to a crane vessel.